Swallowtail angelfish (Genicanthus spp.) have some unique features among the saltwater angelfish species. Here's a significant one: Unlike many angelfish, swallowtail angelfish usually leave coral alone, making them suitable for reef tanks. Like many tropical marine fish, swallowtail angels require specialized care. The various species of swallowtail angelfish reach medium to large sizes. Additionally, this fish swims actively. In terms of aquarium requirements, this means that a swallowtail angelfish needs a larger aquarium of at least 100 gallons. Additionally, the tank should feature open swimming areas. At the same time, the tank should have some recesses and visual barriers. Hiding places and breaking up an angelfish's line of sight can help curb their somewhat aggressive tendencies. 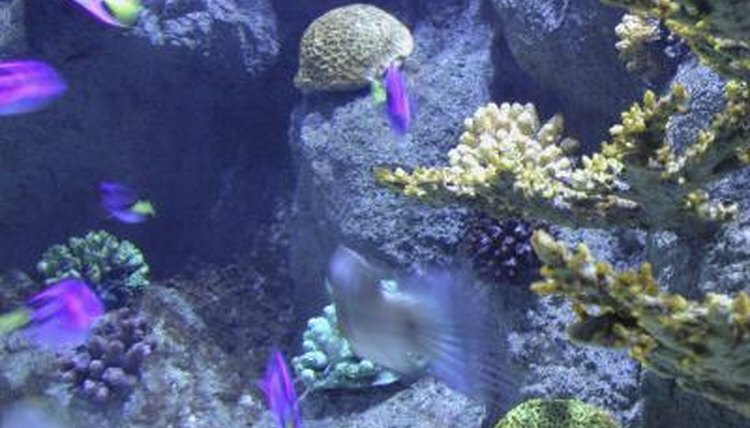 The swallowtail angelfish requires the same water chemistry as most tropical reef fish. Above all, the water should be clean and the water parameters consistent. The pH needs to remain close to 8.3. The temperature may range between 76 and 84 degrees Fahrenheit and avoid sudden changes. A swallowtail angelfish also requires water with a specific gravity of 1.025. You also need to keep nitrate below 40 parts per million -- even lower is better. Ammonia and nitrite must remain at undetectable levels for this fish to thrive. The swallowtail angelfish eats primarily meat, with some vegetable matter. You can feed your swallowtail angelfish fresh or frozen shrimp from the grocery store, shaved to an appropriate size for your fish. The swallowtail angel relishes live or frozen brine shrimp, which you can procure at high-end pet shops. Include an algae product like a nori sheet or a Spirulina algae preparation from a pet shop. The swallowtail angelfish may prey on invertebrates, but his favorites include pests like polychaete worms and bryozonas. Still, feed your swallowtail angelfish at least twice a day or he may start nibbling on expensive corals. Unlike many angelfish, the swallowtail angelfish can get along with most organisms in reef tanks, with a few caveats. If underfed, a swallowtail may start nibbling at corals. Some specimens may eat coral despite their species' general reef-safe label. In terms of other fish, a swallowtail angelfish is usually peaceful with other species. However, a swallowtail angelfish will fight other members of his species and may attack fish with similar body shapes and colors. Do not keep more than one swallowtail angelfish in a tank. Except in those cases, a swallowtail angelfish will get along with most similar-size fish, including tangs, wrasses and dwarf lionfish. Can I Put a Discus Fish in With an Angelfish?